Kitchen. 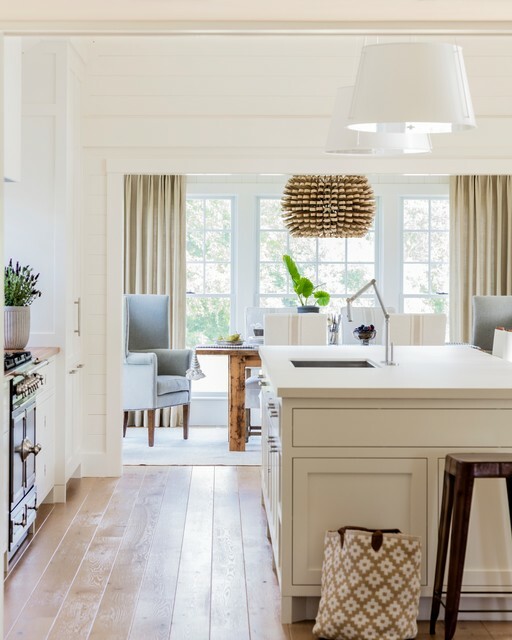 “The kitchen renovation utterly transformed how you experience the entire house with a new vaulted volume of space, high dormer windows for extra light and a mix of modern and classic materials,” Tharp says. “It is a soaring space that adds light and breathing room to the first floor.” The kitchen is open on this side to the dining room and the view through French doors that open to the patio. The photo was taken from the existing living room.Flooring. The flooring throughout the house is wire-brushed oak. sgdweck added this to 11 East St.